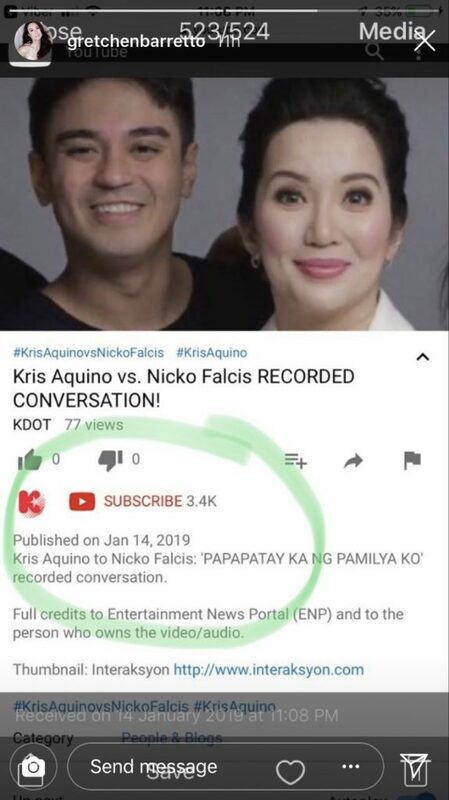 The long-time partner of businessman Tonyboy Cojuangco aint over the ongoing Nicko Falcis-Kris Aquino drama as Gretchen Baretto shared a screenshot of a Youtube account which leaked the alleged conversation between the Queen of All Media and her former manager. 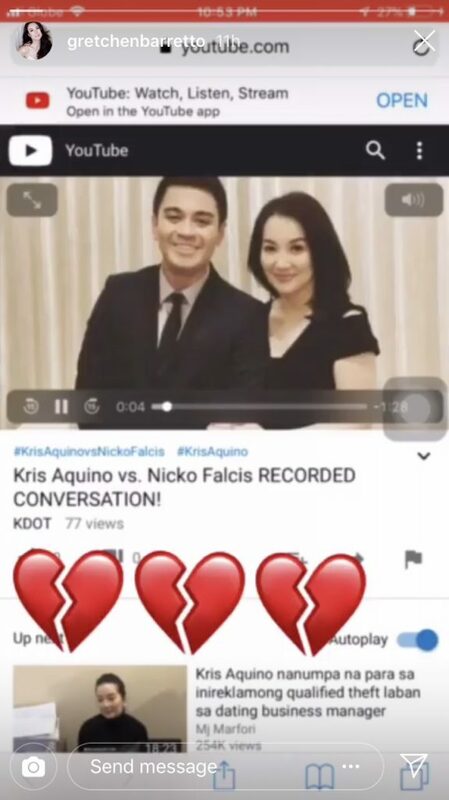 In the said audio recording, Kris was heard threatening Nicko, “Wag ka ng babalik sa Pilipinas. Papatay ka ng pamilya ko. You know what’s wrong with me ? May lupus ako, Nicko. Gusto mo bumalik ng Pilipinas? Dare to step in this country and you will be dead. “Six months ago i was ok. Pinalabas mo umaarte ako pag nanghihina ako. Step foot in the Philippines and they will throw you in jail,” an Angry Aquino said. Just last week, Gretchen lauded Nicko, who for speaking up and learning how to fight against bullying. “I feel for Mr. Nicko Falcis after reading this article. I salute him for his courage to speak the truth, fight for his family name & reputation in spite of the threat to his life. No to bullies!!!! STOP POWER TRIPPING,” Barreto said on her Instagram. Nicko is facing fraud charges for allegedly using the credit card of Aquino’s company for personal expenditures. It's long been said the way to a man's heart is through his stomach. The businessman is all smiles whenever his Dominique is around.